In those early days of my bread making, there was no white whole wheat flour, no vital wheat gluten, no bread machine, just me and my muscles and the most basic whole wheat flour, and the tube-shaped loaves I created were better suited for weight lifting that eating. My bread made even avowed bread-lovers like my parents run the other way when they’d see me stagger up their driveway with a basketful of heavy, brown cylinders. But that was a long, LONG time ago, and I’ve learned a few things since then. …bean broth. Or aquafaba, as people have started to call it. It’s simply the liquid in a can of beans or the broth that’s created when dried beans, usually chickpeas, are cooked. As it turns out, the liquid that most of us have been pouring down the sink can be whipped into meringues and used to replace eggs in lots of recipes. If you want to see some amazing uses of aquafaba, check out the Facebook group where I first learned about it. We’ve been told for years to rinse the liquid off our canned beans (because it tastes bad, because it contains too much salt, because…), and though I do use the liquid from a can of chickpeas in my Hummus in the Blender, I was really reluctant to go much farther with aquafaba. The meringues and other desserts made with it depend on sugar to hold their shape once they’re whipped, so I couldn’t see any healthy uses for bean water. But when Philippa wrote to tell me that chickpea broth was improving the quality of her homemade bread, I just had to give it a try. First I substituted it for the water in the bread I’d been making with a blend of whole wheat flour and bread flour, and it was a definite improvement. Then I decided to put it to the test in 100% whole wheat bread, and I was amazed. The whole wheat bread was almost identical in height to the bread made with a blend of flours, and though its texture was a little denser, the difference was hardly noticeable. I used the liquid from two cans of chickpeas in the following recipe, which gave me about 1 2/3 cups of aquafaba. I topped it off with water to get the full amount of liquid needed for the recipe. (I used the chickpeas to make 3-Minute Chickpea Salad.) The chickpeas I had were salted, so I reduced the amount of salt in the recipe to account for that. This recipe should work in machines that will make a 2-pound loaf of bread. For best results, add the ingredients in the order suggested in your machine’s manual. Place the water or chickpea broth in the bread machine’s pan. Add the remaining ingredients in the order listed (or as recommended by your bread machine’s manufacturer.) Make sure the yeast doesn’t come into contact with the liquid by placing it in a shallow well at the top of the ingredients. Choose either a quick-bake whole wheat cycle (use 2 1/2 tsp. rapid rise yeast) or a regular whole wheat cycle (use 2 tsp. active dry yeast). Press start. Remove bread when baking is complete. Bread will slice best if allowed to cool first. Stir flour before measuring. Use nesting measuring cups and spoon flour into cups until over the top. Level by sweeping across the top with a knife. Bread will slice better after it’s cooled. Nutrition (per serving): 134 calories, 6 calories from fat, <1g total fat, 0mg cholesterol, 221.5mg sodium, 154.6mg potassium, 27.6g carbohydrates, 4.4g fiber, 1.7g sugar, 6.5g protein. Makes approximately 12 slices. Nutrition data is for one slice. If you’d rather not use chickpea broth, I understand, and the recipe will still make a great loaf of bread. But if you give aquafaba a try–in this recipe or any bread recipe–leave a comment to let me know what you think. Hi, Susan. Looks great! How do you slice it so thin? Just a steady hand and a good knife? Any way to translate this recipe for someone without a bread machine? Sounds like something I’d like to occasionally make, but not worth the commitment of another appliance. Is there anything to substitute for wheat gluten if I don’t have it? Not really. The recipe will probably still work, but the bread won’t be as light. Do you have a bread machine recommendation, Susan? Barbara, there’s a link in the post to my new Zojirushi bread maker. I absolutely love it! I’m posting from my phone right now and can’t get the link, but if you look in the second paragraph, you’ll see it there. Many thanks for your reply, Susan – and also for all of your wonderful recipes and tips. I have not tried aquafaba in bread, but I have found that plant milk has an effect similar to what you describe. I recently started making my own bread again, usually with my bread machine, and it is fun to try out different ingredients. I regularly use vital gluten abd applesauce as ingredients. I recently made a no-knead whole wheat bread with potato flakes in the dough (recipe adapted from stuffedveggies.blogspot.com) and it makes a really nice texture. I plan to try a bread machine version very soon. That’s definitely something I want to try adding. I have done a lot of experimentation with bread as I bake it every few days and my husband doesn’t like white flour. Now I use one quarter of white and three quarters wholemeal flour or sometimes completely wholemeal. I add more water or any type of milk to soften the dough. It becomes quite sticky but the result is great. Second is that I let the wholemeal flour soak up the water for longer before I knead it, eg 15 mins. One more thing is that Indian “atta” flour, used for chapattis, is more finely ground than regular wholemeal flour so it’s quite good to use. This is all for normal bread making, I don’t know how it would go with a machine. Susan, why do you use sugar? What happens when I leave it out? Sugar feeds the yeast. Without it the bread won’t rise. I frequently omit sugar in my bread recipes and the bread still rises fine. Thanks for the aquafaba idea. I make all our bread in my Panasonic bread maker. The white whole wheat flour is great. I sub in a half cup of ground flax and can’t resist adding rosemary and crushed garlic. I’m going to try the aquafaba for water. I love your recipes and your ideas. Thanks, Bonnie! Let me know what you think when you try it. Do you think the liquid from home cooked garbanzos would work? I like to cook them in the slow cooker and put them in the freezer, instead of using canned beans. I use a zojirushi small bread maker and make 100% whole wheat, using applesauce or prune puree as a base..no added fat, water, salt and sometimes a little extra sweeter. I particularly like added raisins and cinnamon. I’m sure the home-cooked chickpea broth would be great. Let me know how it works for you. I always use aquafaba from homemade chickpeas – I haven’t bought canned in years. Often after I drain the chickpeas I return the aquafaba to the pot and boil it to reduce it a bit, since it seems thinner than the stuff from a can. Though with a slow cooker maybe you aren’t using all that much water to begin with. Time to get the zojirushi out from the cupboard; adding acquafaba may be the springboard for lightening up other breads. Have a question about Vit B12. Do the foods you eat give you enough or do you take a supplement? I did notice that tofu was one of the foods with B12. I keep reading articles about tofu and breast cancer. Do you have any thoughts on that? Hi Susan – I amy be your oldest blog recipient but I am determined to get all the oil and fat out of my food as best I can – I too just recently discovered aquafaba and am freezing it in ice cube trays for use in anything I think might hold together better or be enriched by its presence. What an amazing discovery – very exciting actually. I am pleased to see your bread recipe as this is my next venture – learning to make bread and flat breads. I already have a breakfast muffin with applesauce and banana replacing the sugar and oil. So far so good. Salad dressings are still a issue to find a great vinaigrette for salads and veggies but I am looking at your blog and will test your chipotle out. One thing I wonder about is how long these things will last in the fridge and how long is a batch of “cheese” – cashews with nutritional yeast last in the fridge? Love your site – it is my premier ‘go to’ site. Can’t thank you enough for being there! I love your helpful, tasty, healthy recipes. There are so many to try out! Will you publish a cookbook? I’ll be first in line to purchase. Ok! Looks like I’ll be getting the bread machine out of storage! I got so discouraged failing with the few vegan, fat-free bread machine recipes I could find that I finally gave up and put the machine in the garage. With this recipe, I will try, try again! Thank you! I have been looking for a whole wheat recipe without oil for a while. I haven’t made bread in a while because all the recipes I found ended up leaving me with a brick for bread. My Zojirushi sat lonesome until this morning. I told the kids I was making bread today because your recipes(the ones I have tried) have yet to fail. They were so happy and I have to say I made the one that was a combo of whole white wheat and regular flour. I used maple syrup instead of sugar. I also measured the flour with my scale. 4.5 oz. = 1 measuring scoop cup. It was the highest loaf I have made. I did take the dough out of the machine and had the second rise in a regular loaf pan and baked for 30 minutes at 350. I don’t like the paddle indents the zojirushi leaves. Thank you so very much. Next time I will make it all whole wheat. I’m so glad to hear that! Thanks for testing it out and sharing your results. I just tried the Pasta and Vegetables with White Sauce that has chickpeas. While I remember liking chickpeas in my late teens and early twenties I found that I no longer liked the taste. Will the water from the chickpeas alter the taste of the bread? I see that you can just use water but I wanted to get a lighter loaf. Thanks. I didn’t notice any chickpea flavor. The bread came out great! My two roommates loved it. The loaf is all gone now. 🙂 No funny taste at all. The loaf was a little large. Do you know how I would cut the recipe down for a 1 or 1.5 pound loaf? My bread machine says it can handle a 2 pound loaf but I’m not so sure. Thanks again. I love my bread machine. A big old white Sunbeam that makes a more or less square loaf. I’ve had it for years. The lettering is wearing off from love. I love your blog/site/recipes. I use them all the time. I’ve been lurking since 2009. I’ve never had a failure until today. I made this recipe exactly as written and my bread blew up! I think 4T of wheat gluten is too much maybe? I rose completely up and over the pan, I tucked it back in, it fell, rose again and baked up with a huge hole under the top crust and a very open crumb. We, of course, ate it anyway. Slicing and tearing into chunks and dunking it into Leek and Mushroom Soup. So what are the two things all women over 40 should know? That is the click bait that led me here and it led right to this post. Which is a single bread recipe. Or are you that disingenuous about getting clicks? Huh? I’m sorry if you were directed her through some spammy link, but I assure you that I had nothing to do with it. This bread recipe stands on its own and doesn’t need clickbait to get attention. I’ll see if I can track down the source of the problem. This is a great recipe! It took me a few trials to get it right, but it is as good as any whole grain sandwich bread that I can get at local bakeries. I made the recipe as written with aquafaba, and sucanat for the sugar. I also found that sifting my flour seems to helps too. I did pre-blend the wheat gluten with the flour, but not sure how much difference that makes. I used the Zojirushi bread machine. The recipe makes a flavorful light loaf with a nice, crisp crust. You mentioned that the yeast needs sugar to rise, but can I substitute a date puree or brown rice syrup? Does it just need the calories? If those wouldn’t work, is there anything else that I could use? I am trying to avoid anything processed, so sugar is something that I am trying to avoid. It feeds on sugar, so either of those should work. I would try the brown rice syrup. I just made this recipe (with water as don’t have aquafaba on hand) and it turned out beautifully! Soo tasty and simple. Thank you! I made a loaf last night, following the recipe exactly, except I didn’t stir my flour before measuring, and my machine’s quick-bake wheat bread cycle takes 3 hours. The bread came out tasting great, and mostly with a really good dense-but-light texture, but the center of the loaf sunk down about half way at some point during baking. I’ve never had that happen. Any thoughts on what caused it, a what, if anything, I should do differently? Other than the big hole in the middle of half the slices, I love the recipe! I must admit that I had never heard of aquafaba but will look into it now as your results speak for them selves. Thanks. I made this without a bread machine and it turned out great! I didn’t need all the flour. I used four cups of white whole wheat flour and needed a little over two cups of aquafaba. I made it into a dozen rolls and one loaf of bread and baked it at 350º for about 15 minutes for the rolls and about 25 minutes for the loaf of bread. Very easy to make and quite tasty! Thanks for another great recipe! I love this bread! I add some Herbs de Provence to add a touch of flavor, but I’ve made it the original way and it’s just as yummy! Thanks for your site, I love it! Hello Susan, I have stumbled on to your website after searching for fat free vegan recipes. I have recently been introduced to Dr McDouggal’s way of life, Unfortunately, I also have celiac, and cannot consume Wheat, barley, and rye. I am desperately looking for a recipe for bread, that is vegan, gluten free, and fat free. 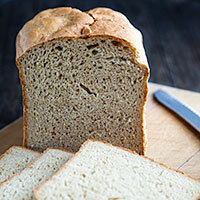 Do you think that the recipe you have for your bread would work at all with a gluten free flour and Xanthan gum? Any ideas would be greatly appreciated! Lovely recipes however I have to stop this web in order to calm my bad temper as a result of those idiot ads. Worth every ad too Susan!!! Making this bread. Thanks so much! Thank you, Brenda! I really wish I didn’t have to have ads at all. Has anyone been able to successfully downsize this recipe? My bread machine makes 2lb loaves, but warns not to add more than 4 cups of flour in any recipe. And I’m not in a hurry to overflow my new machine 🙂 Thanks! Dear Susan, your charming write up sent me off in search of a used copy of the original Laurel’s Kitchen (just for the writing, not neccessarily the recipes). I have the new edition, but it referenced the older edition and baking bread in cans! I’m all nostalgic and weepy now but wanted to thank you. Will be making this bread machine recipe tonight. How far we all have come. I used freshly ground spelt flour and this recipe turned out fantastic! I wonder if the aquafaba is what made the difference? I’ve been using my Bosch and the dough sticks horribly to the sides because I don’t use oil. Then there’s been a few times that it didn’t stick to the sides. The bread rises with air pockets at the top no matter what I do. So it was refreshing to have a loaf turn out beautiful finally!! I will try the aquafaba in the Bosch another day. You must have used “Laurel’s Kitchen”! That was my first vegetarian cookbook and my bible for years! Yes! I still have my 2nd copy on the shelf. Yay! I was afraid I’d never again be able to make bread in my machine, and we really love it in cooler weather with soups, stews, and chili. Hi Susan! I was gifted a bread machine yesterday and would love to try your recipe. If I sub homemade date paste for the sugar and omit the salt, would it affect the result? I’m not a baker and have never made bread before, so I hope it’s ok to ask =). Thank you! I’m always happy to answer questions. The salt probably can be omitted, though it’s used to control the rising of the bread, as well as the flavor, so it might affect the uniformity of the loaf a little. Date paste will probably be okay in such a small amount, though if the bread turns out gummy, that may be why. I forgot I actually have date sugar, so I’ll probably use that instead of date paste. And for the salt, I will use half. I’ll report back! Thank you again Susan <3. I just made this bread, and it came out as promised. Thank you for sharing this recipe. I was looking for a whole wheat bread recipe for my machine for a while now, and I found it. Next, I will experiment with adding flax and seeds. Wow. I’m impressed! I just put this recipe in my Zojirushi and for once, it made a pretty dang good mostly whole wheat loaf! Since I don’t have any gluten at the moment, I made the loaf with 2 2/3rds whole wheat flour and 2 cups all purpose flour. I was afraid 100% WW without gluten would be too dense, or not raise well. I sifted both before I measured them. I also put the dough thru an extra knead cycle to help release more gluten since I didn’t add any but I feel this would do very well with a regular knead if the gluten was added. 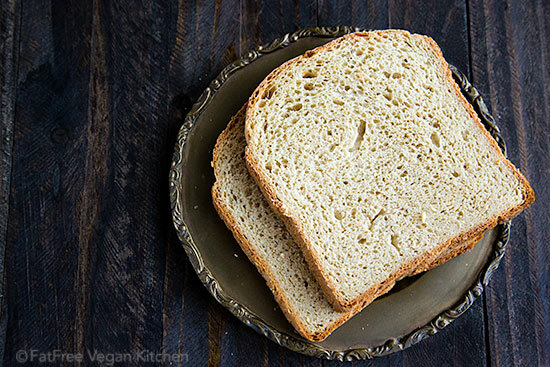 I’d like to try this recipe with more whole wheat flour, so I’ll be making it a few times this week, increasing the WW and decreasing the AP until it either stops making good bread, or bakes the perfect 100% whole wheat loaf! THIS CRUST THO. So crunchy! Much yum! Moist, light and not too sweet like some whole wheat recipes. Aquafaba isn’t always available, so I don’t know how it would work with only water. The top still fell in slightly, a problem I have consistently with whole wheat breads in this machine. Crust was SO crunchy it was difficult to get out of the pan/stuck on the paddles! I’m sure this is sacrilege, but would it hurt to add a little oil or butter? I don’t know. I’ve never made it with oil and designed it to be made without it. Thank you for your website. Thanks for all of your recipes. I’ve been alternating between the whole wheat bread recipe in the Cuisinart bread machine book and the one in the Oster bread machine book with some success, but this is the best, the tallest, and the most even whole wheat loaf I’ve ever made. It’s delicious. It’s a keeper. Sorry to report that the Cuisinart leapt off the counter while kneading and self-destructed last year. The Oster mad me very happy today. An always problem(! )….can the salt be reduced? You can probably reduce it by half without affecting the texture of the bread. Susan… you’re sure is my favorite. I don’t think I would have survived with this WOE when I started 4yrs ago without your recipes! I’m going to make this bread today but I’m don’t have white whole wheat, just regular whole wheat flour and whole wheat pastry flour. Why do you use WHITE whole wheat…. and does it matter? Thanks for your kind words, Janet! 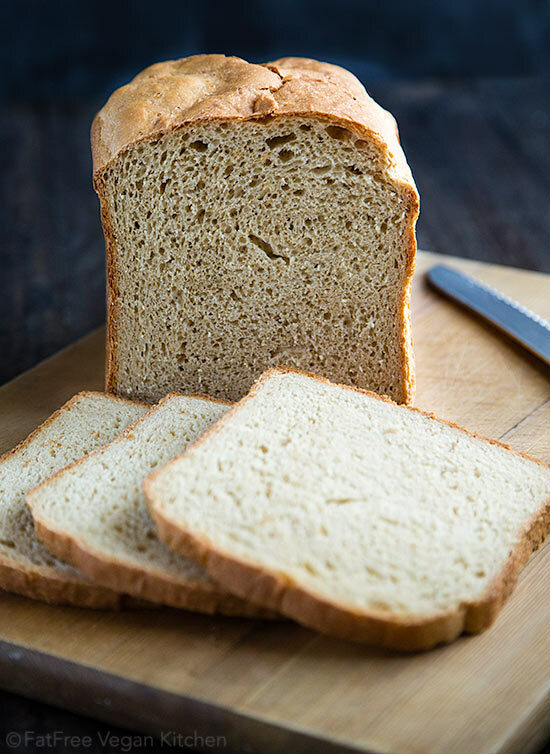 I use white whole wheat because it has a lighter flavor than regular whole wheat, but it doesn’t matter which one you use, especially if you like whole wheat flour. I hope you enjoy the bread!